MIFEE has never been a single clear plan for development. There are different versions of what that development may entail, and these differences reflect the vested interests and manipulations of the corporate and government actors involved. The process of decision-making is not transparent and there are no authoritative sources of data by which to accurately determine the project’s status. Understanding MIFEE means building up a complete picture from a patchwork of all the different available sources. For example, MIFEE’s official propaganda tells of the planned large-scale cultivation of rice-fields, integrated with other basic foodstuffs, to provide for Indonesia’s food security needs into the future. Yet if we look for news of what is happening on the ground we hear of villages evicted and huge swathes of forest cleared by one of the main MIFEE companies as it exports wood chips to be made into paper. Given such divergence we can be forgiven for asking what this mega-project is really about. What form is it likely to have if it goes ahead? Is MIFEE in practice different from MIFEE in theory? The Saudi investment had fallen through by March 2009, with the global financial downturn given as a reason(36), but the seed was well and truly sown. MIRE was repackaged as MIFEE, and several Indonesian investors expressed interest. Most of these companies were the businesses of the Indonesian elite, who often have ties to the military or political parties. MIFEE’s proponents had hoped that it would be launched at the start of 2010 in the presence of President Susilo Bambang Yudhoyono, but that plan fell through. In the end the program was formally inaugurated in a ceremony on the 8th August 2010 at Medco’s pilot project in Serapu. However the people of the village had not even been informed that such an event was going to take place until it happened – an inauspicious start for how MIFEE companies would relate to local people as the project progressed. The suspicious death of critical local journalist Ardiansyah Matra’is a few days before cast another shadow over the event. Table of potential investors in MIFEE. Data from Bapinda Merauke May 2010. From these figures we can see permits given out by this local government agency give a vastly different picture of MIFEE from that described in the ‘Grand Design’. Instead of the promised structured and centrally-planned intensive production of food crops, what the companies that have got involved have been proposing is a typical mix of large monoculture plantations, such as is common elsewhere in Indonesia: oil palm, sugar and industrial tree plantations. It must also be noted that the effect of the new laws which have been created around MIFEE, and the orientation of local and national government to promote investment, have acted as incentives for companies to invest, taking advantage of streamlined processes of getting permission and tax breaks. Whilst the status of MIFEE as an integrated process remains unclear, the doors to investment have well and truly been opened. If things progress as they seem to have started, then it is totally possible to imagine that Merauke, amidst all the promises of becoming the granary which will guarantee Indonesia’s basic food needs, will just end up as another sprawling maze of oil palm and industrial tree farms. For that reason, for the purposes of this briefing, we treat MIFEE as any of the possible scenarios that may arise from the agricultural development of Merauke. There may yet be a few twists and turns before agricultural development succeeds but these need to be seen essentially as overcoming barriers to the enclosure of a vast new area in the service of Capital. 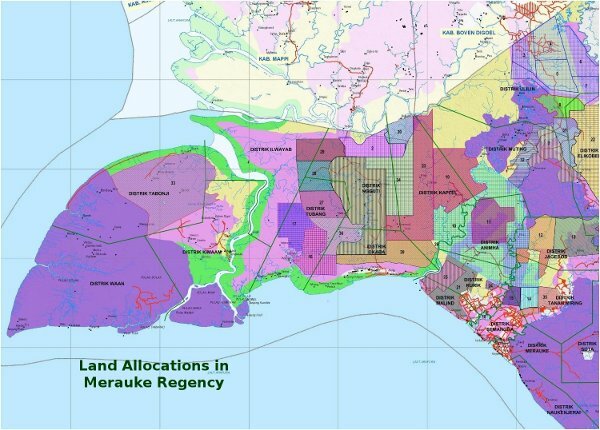 (42) Merauke, together with other parts of Southern West Papua have been designated as having large potential for agricultural development, yet currently they yield very little for Indonesia’s economy. Therefore they hold a tantalising potential for economic growth. Although there are existing peasant farmers in Merauke and a state-owned company is developing plans for peasant-run businesses within MIFEE, it is clear that the main thrust of any business there will be corporate-led. 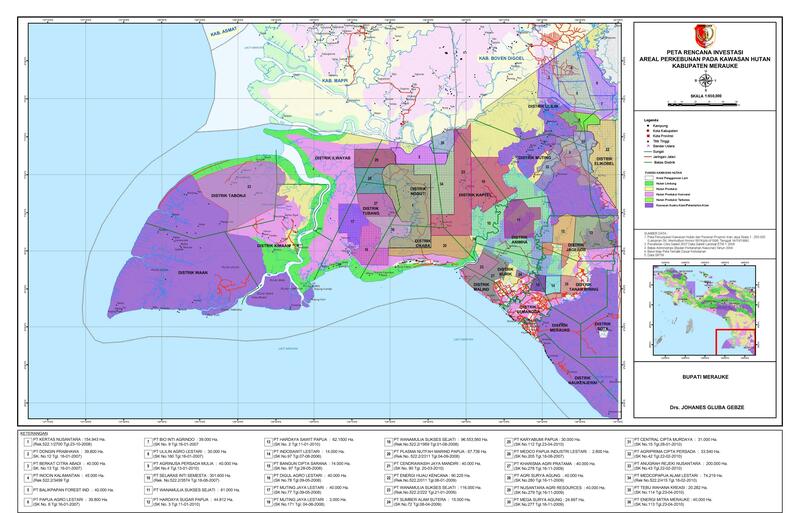 mohon untuk di publikasi data2 spesifik terkait perampasan tanah (land grab) dalam proyek MIFEE, kebetulan saya lagi menulis tesis tentang Land Grab dengan studi kasus MIFEE jg, dan sangat membutuhkan informasi serta dukungan data yang akurat terkait persoalan ini,,mohon bantuanya,, terima kasih. Mengapa dilihat negatifnya saja?? Persiapan dengan mental dewasa dan komprehensip pasti ada. Ini termasuk penyiapan kearifan lokal; memang akan butuh lama, namun upaya “COLOSSAL/ KOMPREHENSIF” perlu INVESTASI/ PENYIAPAN MASSIF!